Each week in our Maker Camps we took on a different angle of "Making". Our Creativity Camp was inspired by the program Destination imagination - where teams of kids take on a challengeand create a multifaceted solution through the course of a season. Teams compete in regional, state and global competitions - where they present their solution and also compete in an Instant Challenge. In our Creativity Camp we squeezed a season of DI-inspired activities into one week of wild creativity and making. In addition to their main challenge- each morning teams would get an Instant Challenge - sometimes asking them to build something from household materials or perform an improv act.... from challenge to solution - all challenges took less than 10 minutes. 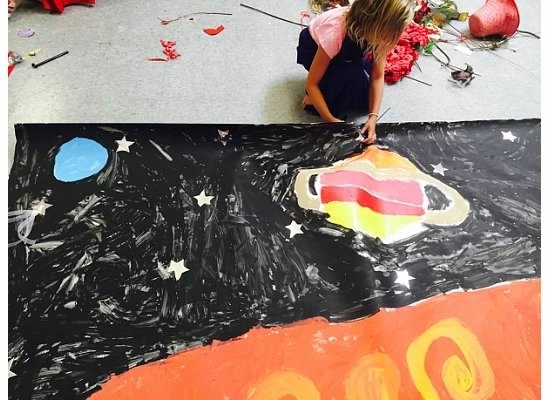 During the week, kids learned about story-line development, basic construction, backdrop creation, sewing and costumes, performance tips, prop building and more. The Camp Challenge... The Destination: Out of This World! It is the future, and you decide to go camping. In SPACE. The first planet you land on is inhabited with aliens that speak a different language than you. They need help – but you can’t understand what they are saying. It is your job figure out how to communicate, and to take your alien friend on a side trip to help solve their problem. Create and present a theatrical performance of an original Story about your alien’s unusual problem. Use a Technical Methods to cause a Bizarre Happening to take place. Create at least one Side Trip integrated into the Presentation. The kids were amazing with their curiosity and invention. Resident Maker Heather Lee taught some backdrop and art skills to them one afternoon. Sewing tips were presented. Glue gun skills and prop building skills were developed. One team created a translation wand - to understand the alien they encountered. One team made a translation helmet and camping convenience store. Camping Convenience Store that was part of the story. Cardboard is always a favorite for building - and one team made a rocket prop for their blast into space. Horn of plenty transformed into a bird mask. While this week was less "techy" than our Robotics or Spy Camp, Creativity Camp developed skills of teamwork, problem solving, building, performance and more. It was a great week of creativity and making!